There’s no better smell than cookies coming out of the oven (though my grandma’s ‘butter n’ onions’ was a close second place). But, we all know the consequences of baking cookies around the holidays. You eat them. Sometimes even a whole pan. So how do you make your house feel festive, cozy, and full of holiday cheer without the risk of dinner turning into a fistful of cookie dough?! Try a simmer pot. 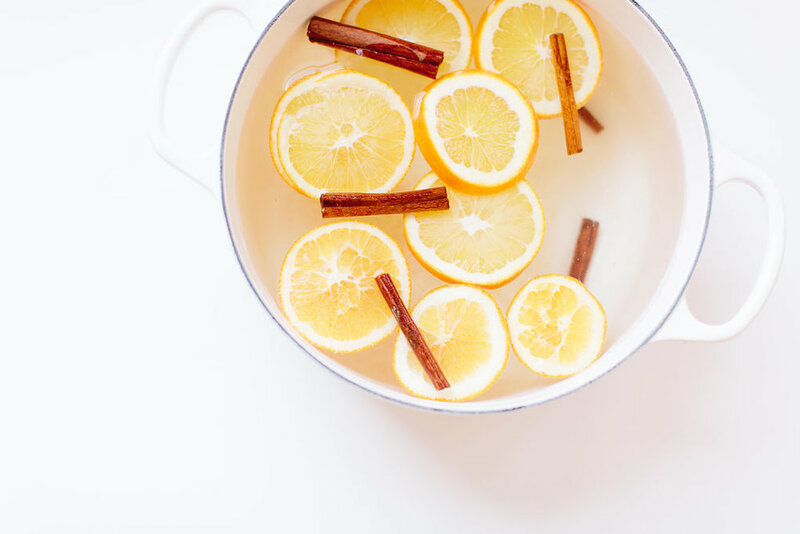 My favorite combination is orange and cinnamon, but you could toss in cloves, star anise, apple peels, lemons, bay leaves, vanilla, or even nutmeg. All your neighbors will wonder what’s cookin’ but you’ll know the secret: nothing. Slice the orange crosswise and place in a medium pot. Add cinnamon sticks and fill pot with water. Bring to a boil, then turn down to a simmer (leave pot uncovered). Let simmer and enjoy the holiday cheer! Do not let the pot run dry. Keep an eye on the pot and replenish with more water as necessary. I keep my pot on the stove for a few days, and just add water and turn on the burner when I’m in or near the kitchen.